Apply now to become an Online Screener and use your expertise to evaluate the Best Independent Films from all over the World! What does it mean to be an Online Screener? All members of our Screening Committee Online are required to be available every month and report to the President of Jury, who assigns films to every member of the Screening Committee Online. Every month the Committee evaluates all the films submitted to Mindie. All the films are evaluated on their overall quality, production value, development of the story and cinematography. The films will then be sent to the Jury Members. The Jury will select the Monthly Winners for each category. Please understand that this is not a paid position. The Online Screener will be awarded every year with an all access ticket to the Annual Mindie Event. To have relevant experience as independent filmmakers and/or industry professionals. To love cinema and to be an indie film addict. Having previous experience as a jury member/screener for other festivals is a plus. To fill the application form takes about 20 minutes. Once sent, it will be evaluated and you will receive a response in about a week. We will email you our decision (if you passed or not the application process) and you will start watching films from the following month. For the first three months you will be on trial, and depending on your commitment to the Screening Committee, we will decide if you can keep being part of the team. If that is the case, we will add your name and profile on our website under “Screening Committee”. SCORE: Grade the film from 1 to 5 -- 1 being POOR and 5 being EXCELLENT. I understand that this is not a paid position. 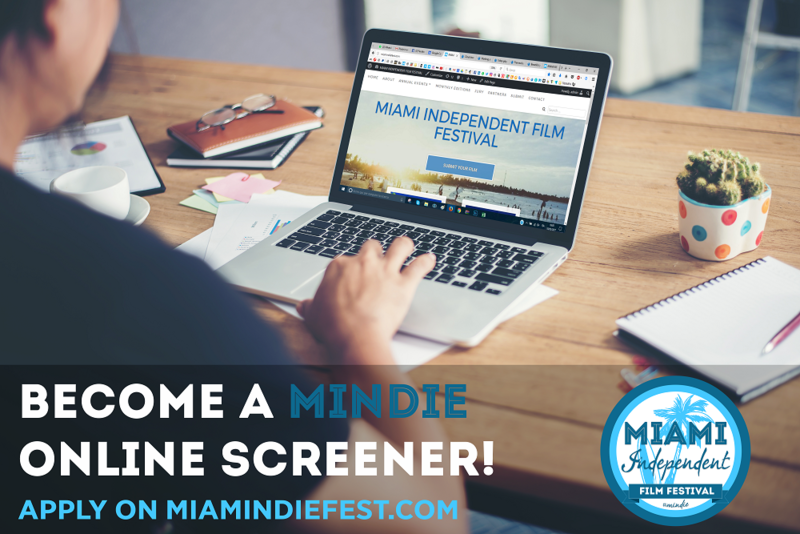 The Online Screeners will be awarded every year with an all access ticket to the Annual Mindie Event. I understand that if I have a film in competition on a certain month, I cannot be part of the Screening Committee Online for that month. Failure to do so will result in the exclusion from the Screening Committee and the film will be also eliminated from the competition. If You don’t see a confirmation page after you submit your application, please don’t send another application but check your email. You will receive via email a confirmation that your application has been received. How long after I submit the application should I expect to hear back? Usually it take around a week.